I baked and mashed them, then decided to season them with thyme, parsley and rosemary (WOW), and also added a marvelous Italian cheese blend our H-E-B grocery stores carry that includes Mozzarella, Parmesan, Romano, Asiago, Provolone and Fontina cheeses. W-O-W!!! This casserole was so succulent and amazing. I love fontina cheese anyway. It adds a little sweetness to anything you make with it. 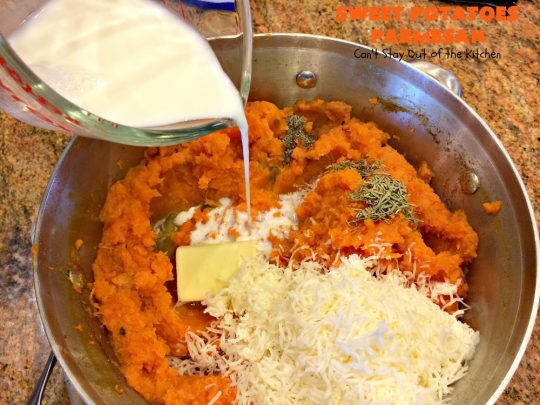 Add in all those different cheeses and herbs, and Sweet Potatoes Parmesan was truly one of the tastiest recipes I’ve ever eaten. While this recipe has cheese, milk and butter, it still does not have all the calories from most sweet potato casseroles that include a praline topping or all the marshmallow stuff. 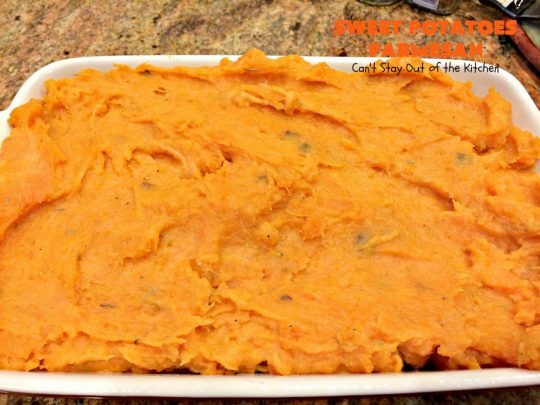 While this side dish does have some sweetness from the sweet potatoes, it is mostly a savory dish and quite wonderful at that! If you’re looking for quick, easy, and delicious than you’ve come to the right recipe! 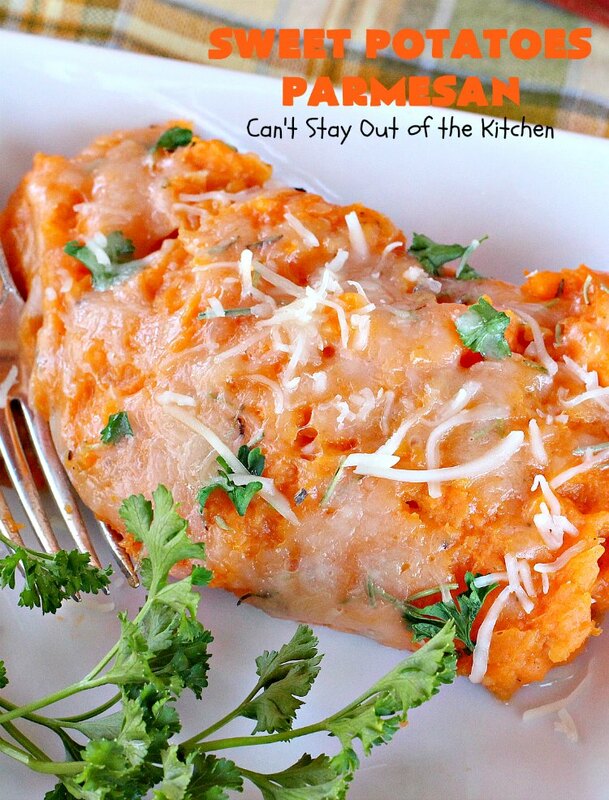 Sweet Potato Parmesan is a good accompaniment to any main dish entree including chicken, beef, fish or pork–and probably game, although I never cook it. Give this recipe a try the next time you want to use up an excess of sweet potatoes. And, by all means, go find this cheese blend. Plain parmesan, or plain romano or any other plain cheese without the blend of the other five cheeses won’t give you the taste that makes this casserole superb. Also, please don’t leave off the rosemary, thyme or parsley or you won’t get the breadth of taste you need to experience this fabulous recipe. Sweet Potatoes Parmesan is one tasty side dish. 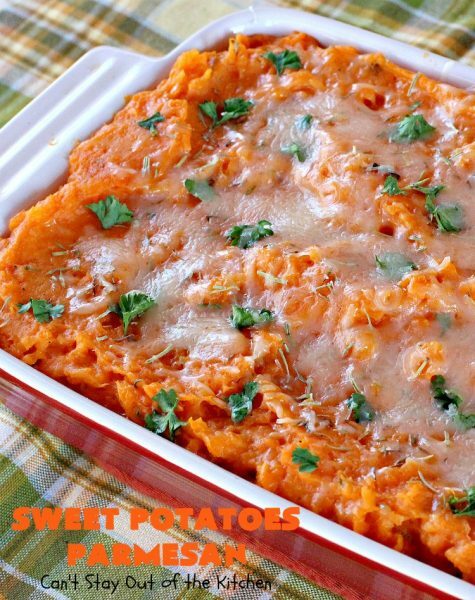 This casserole is so hearty and filling you may want to make it for Meatless Mondays. 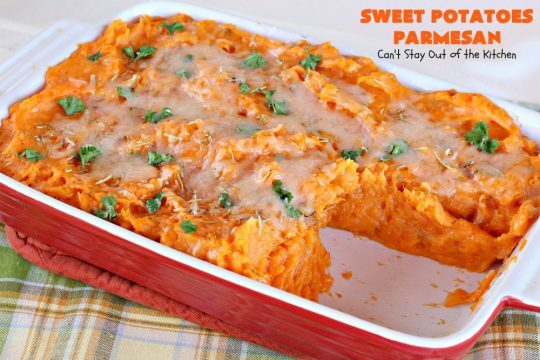 Here’s a close up of Sweet Potatoes Parmesan. Most of the cheese on top melted into the sweet potatoes. I sprinkled a few flakes of cheese over this serving. 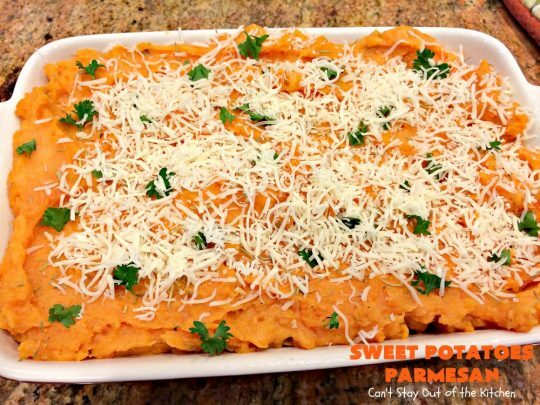 Sweet Potatoes Parmesan is a wonderful, savory, full-flavored casserole even the pickiest eaters will love. 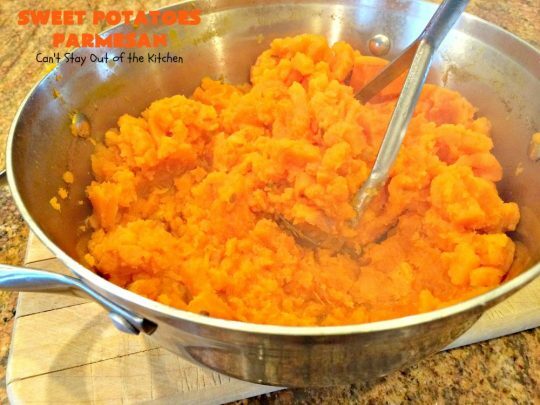 Boil sweet potatoes. Drain and mash with a potato masher. Add butter, milk, 1 cup of the cheese, salt, pepper, thyme and rosemary. Spray an 8×12″ baking glass baking dish with cooking spray. Pile sweet potato mixture into the dish. Sprinkle with fresh parsley and two pinches each of thyme and rosemary. Sprinkle remaining 1/2 cup of Italian cheese blend over top. Cover with foil. Bake 15-20 minutes at 350 until dish is heated through. 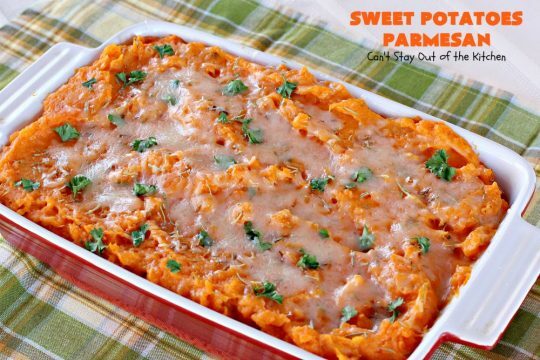 Doesn’t Sweet Potatoes Parmesan look marvelous? 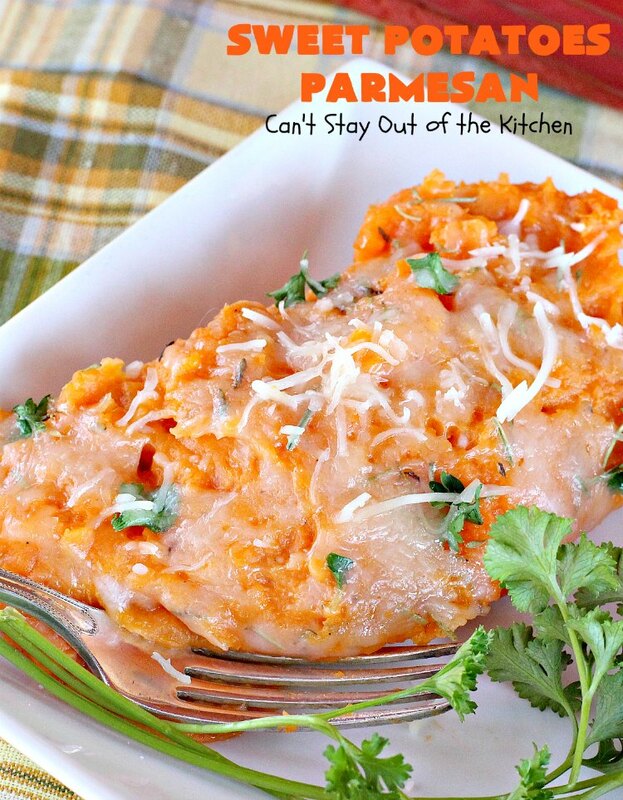 Sweet Potatoes Parmesan is perfect for holiday meals like Thanksgiving, Christmas or Easter. But we enjoy it for regular dinner menus too. 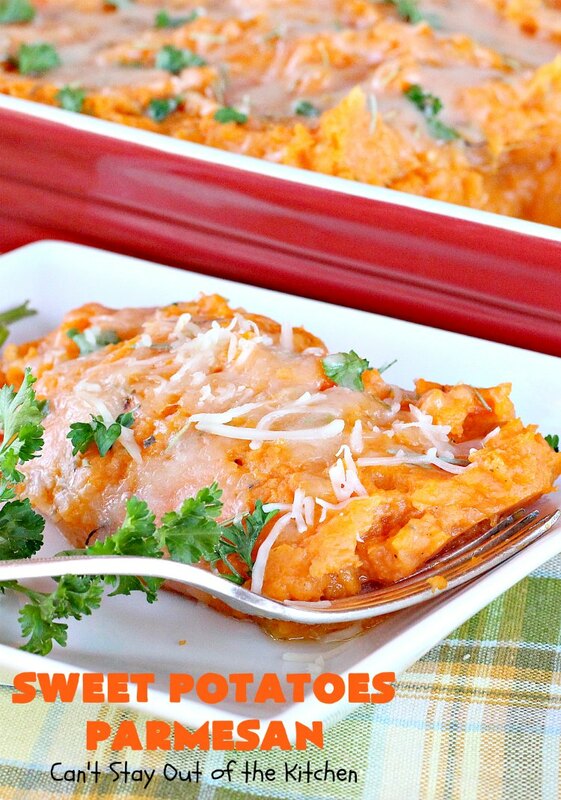 This turned out to be one of the BEST tasting sweet potatoes dishes I’ve EVER eaten. It was terrific. Sweet Potatoes Parmesan is filled and topped with parmesan cheese adding spectacular flavor. Lovely mashed sweet potatoes dish with an Italian cheese blend of 6 cheeses, seasoned with thyme, parsley and rosemary. Gluten free. Amazing taste. Add butter, milk, 1 cup cheese, thyme, rosemary, salt and pepper. Pour into an 8x12” glass baking dish that’s been sprayed with cooking spray. Sprinkle 2 pinches thyme, 2 pinches rosemary, fresh parsley and ½ cup Italian cheese blend over top. Bake about 15-20 minutes at 350° until heated through. 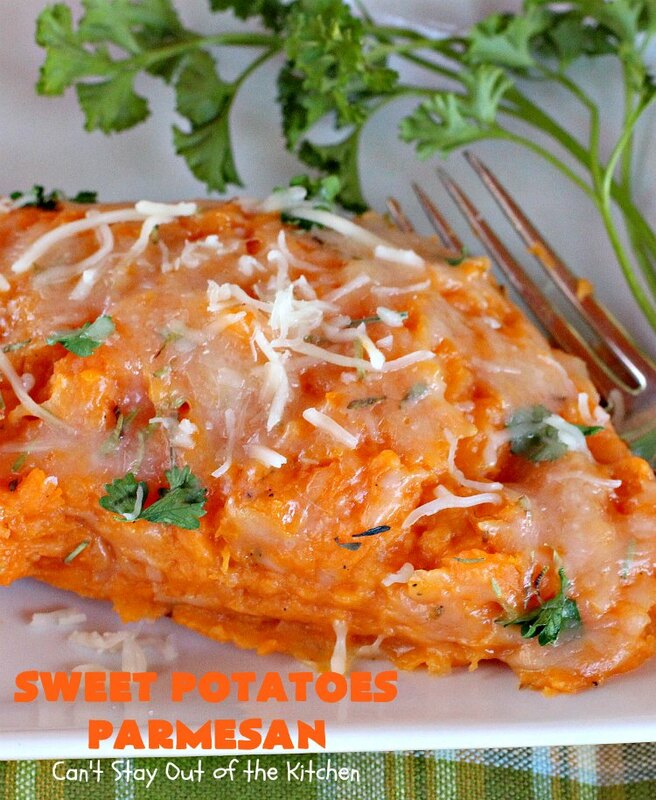 NOTE: Preparation time does not include time required to bake sweet potatoes the first time. Pour into an 8×12” glass baking dish that’s been sprayed with cooking spray. The cheeses and seasonings included in this recipe take a regular sweet potatoes dish and transform it to extraordinary! 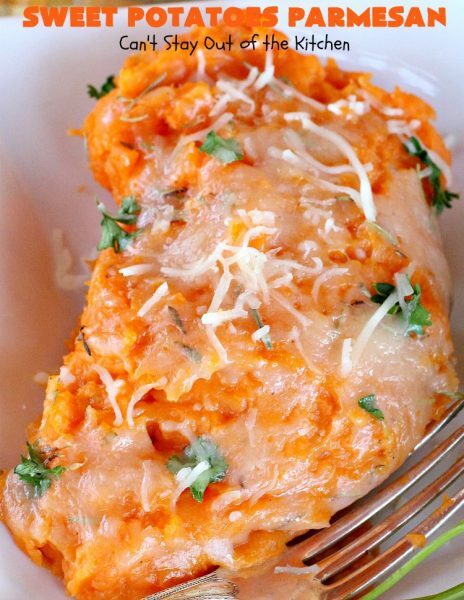 Garnish your individual servings of Sweet Potatoes Parmesan with more cheese and fresh parsley, if desired. 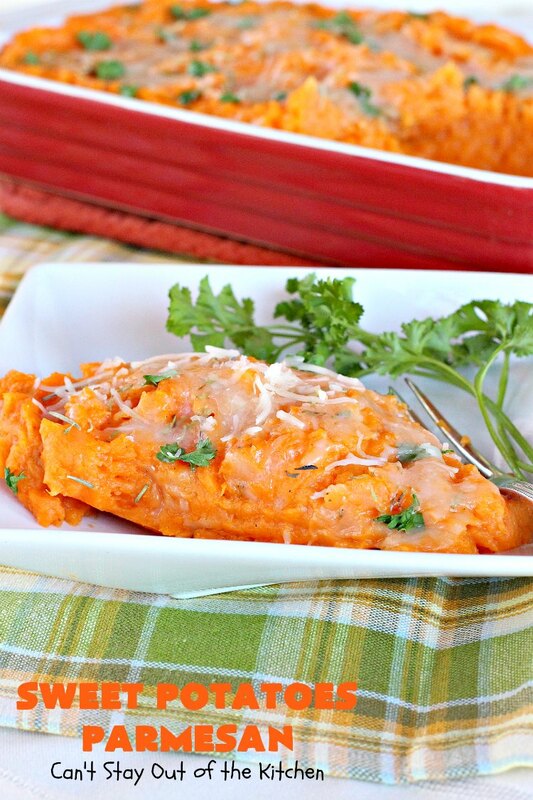 I loved the delicate herb flavors in this casserole. Thyme, rosemary and parsley go together very well.